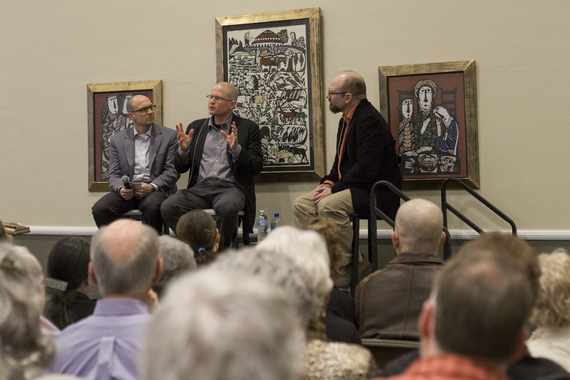 Christian Wiman and I have an odd kinship: we were both diagnosed with incurable cancers at the age of 39. Our cancers are very similar, so we can talk shop about chemo, side effects and the bizarre experience of hearing that our lifespan has likely been chopped by decades. We're both parents of young children. And we've both written about our Christian faith in light of our cancer journey -- with Wiman, My Bright Abyss, and with me, Rejoicing in Lament. I spent my adult life trying to write poetry. And loving poetry. I love to read poetry. Even old things that I've read over and over, Milton and Wordsworth -- I love them. So it was inevitable that I would turn to something that I love that has helped me to get through things. [Poetry] doesn't describe experience, it gives you experience. The thing in itself. That's what great art does. And for me what I have needed at times when my mind was slipping out of control is to have these figures of consciousness formalized in front of me that I could enter.... It's what Robert Frost called a 'momentary stay of confusion.' But momentary is something. And I found, through particular things, and there were definitely moments when I did not want poetry, but it has carried me through. And I love it very much. Since our discussion, I've continued to soak up the wisdom of Christian's response: poetry provides a place to dwell. It is not a literary "selfie." It formalizes, and actually creates a certain kind of experience. That is no small thing for anyone. And for cancer patients whose world is slipping out of control, it provides something better than an "answer" to our unending questions: it provides a place to enter into, with all of our questions, amidst all of the mystery before the face of God. My response was quite different -- mainly because I'm not a poet, but a theologian. I agree with Christian's response as far as it goes. But I feel that it is misleading to say that "I turned to poetry" in light of my cancer: I turned to scripture. And God had already chosen to speak in the form of poetry in the most sustained places where the Bible reflects upon the life of suffering before God (e.g., Psalms, Job). So my question was: Why does God turn to poetry? As I said that evening, "I think that [poetry] has a power, the psalms as poetry, as prayer -- it has a power that just a listing of propositions doesn't have. And it has a power that even prose narrative doesn't have in the same way." The Psalms do not simply give us an "answer," reflect our own emotions or even insert us into a narrative. They actually reshape our affections as we dwell in them. We don't come away from a Psalm of lament with closure about exactly why God allowed a tragedy. And they do not simply "vent" my negative emotions. They put them on a path. "The psalms actually shape and reshape how I am feeling. Whether it is anger, or confusion or joy, all of that is brought before the face of God in the psalms." Why did God choose poetry? Why is the poetry of the Psalms of lament so frequently quoted in the New Testament, prayed even by Christ himself? Perhaps we need to remember how God speaks through these literary forms, and not just what the texts say. What does the poetry of the Psalms and Job do for us as readers that a narrative or didactic teaching would not? It forces us to loosen our tightly-clenched fists and admit that we are not in control. We are not God. We don't know why tragedy takes place. But we do have a place to pray, a place to dwell. We are not given God's reasons for allowing apparently senseless suffering. It enables us to enact, enter into and protest of suffering before God, that this broken world is not the way things are supposed to be, even as we trust that the world is in God's hands. The poetry of scripture does not bring closure on all of our questions. But it gives us a place to dwell in the midst of suffering: a place of lament and of hope engendering a desire for compassionate action toward other sufferers. Perhaps that's what fallen, finite creatures like us need in times of harrowing suffering, and not the "answers" we urgently insist upon.